It's been some time since I last read anything by LeGuin (I think that it was The Word for World is Forest, which I liked); I've never really been much into her for some reason. Got no idea why. She writes quite vividly and most of the time she has interesting stories to tell. 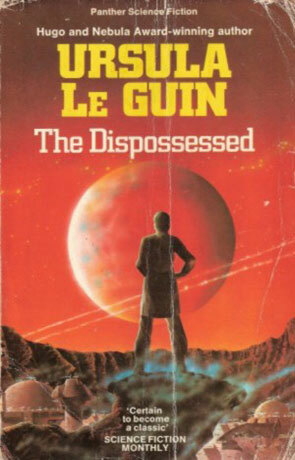 The Dispossessed is two entwined stories in one – firstly it is the story of Anarres, the anarchistic home planet of Shevek, and secondly it is the story of Shevek's travel to the sister planet of Urras (which is governed a lot like most countries on present day Earth). Let me make a personal comment here: I've considered myself an anarchist for as long as I remember having a political consciousness, and one of the most common misconceptions that I've noticed in people when I tell them this is that most people think that Anarchy means the same as Chaos. The second most common misconception is that anarchy is some kind of communism. The third most common misconception is that if I'm an anarchist, then I'll probably want to start a revolution and force everybody else to live in an anarchistic society. Anarchy probably means as many different things as there are people calling themselves anarchists. The anarchistic society described in The Dispossessed is a society that is as far as possible from the (in my humble opinion, ultra-libertarian-) anarchistic society described in Heinlein's The Moon is a Harsh Mistress. If you are interested in this subject, you should read these two books, to get some ideas as to what anarchy can be. As to what my own personal anarchistic utopia looks like, well, a little from both books – I'm not 100% decided on what my utopia looks like, but my basic premise is that everybody is allowed to do anything he or she likes as long as he or she doesn't hurt or oppress other people. Written on 1st December 1999 by TC.